Dairymaster manufacture and deliver automatic scraper systems to dairy, cattle, pig and mushroom farms throughout the world. These systems now operate in every corner of the globe from small family farms to large industrial farming facilities. 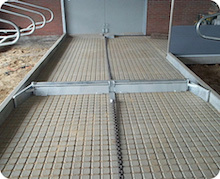 The Dairymaster track type system is very low maintenance and exceptionally easy to operate and control. We are acknowledged for unequalled standards of reliability and adaptability. As cow numbers are increasing and buildings are getting larger you need a scraper that is robust, strong and efficient - think Dairymaster! Let JOZ do the scraping. We have the widest range. Whether you farm milk cattle, meat cattle, pigs, chickens, ducks or horses, a wide range of slurry scrapers is available for every barn. We supply scrapers for grid floors and sealed floors, liquid slurry, solid slurry, slurry with sand and every conceivable combination. Whether you have a barn for 30 cattle or 3000 cattle, our scrapers will keep it perfectly clean. Every farm is unique and requires its own slurry disposal system that matches the architectural characteristics of the barn and the financing capacity of the farm. The system must also meet any government requirements. JOZ will identify the solution to your slurry problems, based on these criteria.